Green Revolution was a huge success that spearheaded agricultural research for several decades and played an important role in feeding the world by significantly increasing food production mainly in the developing countries. However, in spite of immense turnaround in productivity through Green Revolution, conventional plant breeding has done little to improve the life of subsistence farmers across continents. Formal breeding programs have primarily catered the well-off farmers, and the poor farmers have not reaped the desired benefits. The poor and marginal farmers of the developing countries are faced with problems like inequitable land distribution, insecure ownership, fragmentation of holdings, inadequate irrigation, poor credit facilities, improper marketing, and slow growth of allied sectors remained aloof from this spectacular phenomenon. 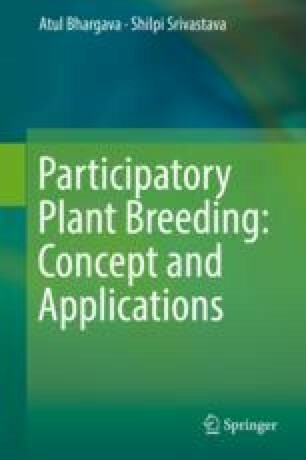 Participatory plant breeding (PPB) is the development of a plant breeding program in collaboration between breeders and farmers, marketers, processors, consumers, and policymakers. In PPB, farmers and researchers work in tandem with farmers taking a lead role in the design, implementation, and evaluation of the breeding material. The chapter discusses at length the different forms of farmers’ participation in crop improvement.